The amount of money put into alternative investments grew by 19% last year, according to a May 2015 report from advisory firm Money Management Institution. London-based research firm Preqin had growth at 11% in 2014 to $7 trillion — differing slightly from MMI data, but likewise a huge increase. And according to the U.S. Securities and Exchange Commission in April, the alternative mutual fund market (funds that use non-traditional investments and trading strategies) grew from about $76 billion in assets at the end of 2009, to more than $311 billion in assets by the end of 2014. Diversifying outside the major markets can mitigate portfolio risks, especially in times of economic crisis. 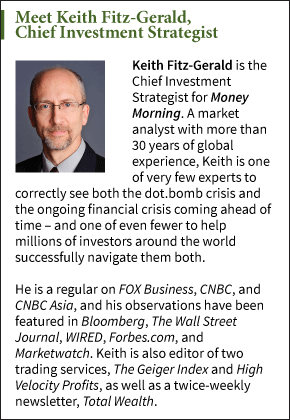 "With one eye on the recovery and one eye on the monster that may surface from under their beds, investors have gotten a lot more interested in alternative investments," Money Morning Chief Investment Strategist Keith Fitz-Gerald said on June 15. "They've always been there as an asset class so that's not unexpected. But what's new is the understanding of the role that they can play in turbulent times." A hedge against the swings of the larger markets. In other words, alternative investments are less prone to volatility "despite the fact they seem riskier than traditional assets," Fitz-Gerald said. A way to play the market when stocks are overvalued. An exciting way for passionate collectors to make money. Still, Fitz-Gerald warned, where there are rewards, there are also risks to navigate. "More interest in alternative investments is good because most investors have historically ignored alternative investments. But it's also bad because investors often have an overly narrow view of what an alternative investment can be," Fitz-Gerald said. "Too many investors view commodities as the only type of alternative investment, and commodities can be every bit as volatile as the overall markets – and sometimes even more so. In reality, there are all kinds of investment-grade products ranging from art, to wine, to stamps and even my personal favorite, classic motorcycles." "The 1960s vintage E-Type Jags I grew up appreciating for $15,000 a copy, can now fetch more than $150,000 at auction. There's no question they have a unique appreciation potential." They also have unique risks, Fitz-Gerald warned. "You never want to buy because something's a good 'deal.'" Markets for alternative investments are typically more difficult to track compared to traditional markets. Storage and insurance pose additional hurdles for tangible alternative investments. Illiquidity can be a problem compared to the relative liquidity of stocks, bonds, and cash. Real estate is a common alternative investment that offers the opportunity to own property. Typically, investor(s) lease a structure to tenants in return for income and the potential for capital gain upon the sale of the property. Because of its low correlation to other asset classes, real estate is an excellent portfolio diversifier. It also serves as an inflation hedge — real estate returns are linked to rent received from tenants. And because real estate is a tangible asset, investors have a greater degree of control over its performance (renovation, improvements, choice of tenant, etc.). A downside is real estate investing generally requires a large initial investment. Transaction costs are high, and almost all real estate assets require management. Some investors buy and sell the physical commodities themselves, like oil or gold producers. However, most investors use options, futures, or ETF markets to get involved. Commodities markets offer price tracking without the burden of trading the underlying commodities themselves. Because commodities are real assets (unlike stocks and bonds), they typically rise alongside inflation, making them a great inflationary hedge. Like all alternative investments, they are portfolio diversifiers. You can add illliquidity and high initial costs to purchase real estate, as all asset classes have been inflated in the past five years. If interest rates or mortgage rates were to rise very much at all, it could reduce the market value of many recent real estate transactions. If rental income remains constant and occupancy rates high, you might still be able to weather it out. However, real estate from today's price levels may require an unusually long term perspective and time commitment to prove profitable. No investment today is risk free in our managed economy and markets. If you end-up overpaying, you lose.